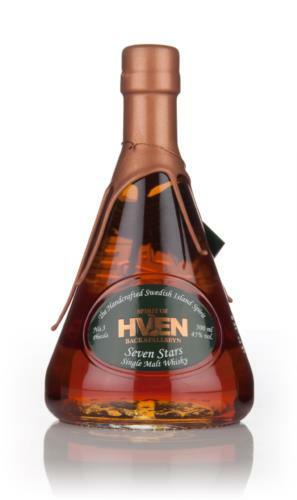 Spirit of Hven Seven Stars No. 3 Phecda is the third release in a series of whiskies produced by the Swedish distillery Spirit of Hven. As with the releases that came before it, the Phecda takes its name from the stars above; the Phecda being a star in the asterism (pattern of stars) Ursa Major. Phecda is described as being somewhat hotter and larger than the sun around which our planet circles. The whisky itself is a medium peated malt which is crafted, from barley to bottle, by the family owned Spirit of Hven on the island of Hven in Sweden. After the wash (similar to beer without hops) is distilled, the spirit is placed in barrels made from Quercus Muehlenbergii (American white oak known as chinkapin oak) from Missouri and Quercus Petraea (French oak) from Allier. Over the course of whisky’s maturation, during which the spirit soaks up flavours from the oak, the oak seems to have infused the whisky with some very distinct aromas and flavours; the most interesting of which are a fiery spice and a winy base note of fortified wine and brandy over which floats a thin smokiness. Soft waves of vanilla are immediately noticeable, and the bouquet quickly develops into Panettone soaked in brandy and a dash of Sambuca, ground coffee, tobacco, new leather, stewed dark berries, banana, fragrant woodsmoke, scorching charcoals and peppermint Fisherman’s Friend. The taste of fortified wine is followed by a fiery spice, which is peppery with a mildly burning jalapeño bite, dark chocolate, tobacco and pencil shavings. The peat is there, but it tastes more of tobacco. As the burning spice recedes, the fortified wine morphs into young style “hot” brandy, similar to Spanish brandy matured in sherry casks. There is the constant taste of rock salt underlying the winy sweetness, and an oily film coats the tongue and emits flavours of butter and caramel. The finish is somewhat smoky, with the aftertaste of prunes, sweet Pedro Ximenez sherry interwoven with more drier fortified wine, brandy filled chocolates and the faint kiss of lapsang souchong. Oily and buttery undertones linger on the base of the tongue, with salted caramel and coffee lollies. This whisky pairs impeccably with a fine mild-medium cigar, such as a Macanudo Estate Reserve or a Romeo y Julieta No 1; cigars that seem to appeal to the mass market for their smoothness, which ensures they will not dominate over the malt. This whisky was also delicious with chocolate, especially coffee or hazelnut truffles, and spicy cured meats. Buy it, if you enjoy a spicy whisky with a fortified wine/brandy base note and mild undertones of peat that resemble tobacco. Spirit of Hven Seven Stars No. 3 Phecda is a creative and balanced malt, with a mouthwatering kick of flavour. It is also smooth and quaffable, and coincidentally the perfect accompaniment for a night of star gazing. Bra gjort Spirit of Hven! Bra gjort. This entry was posted in Swedish whisky and tagged hven, malt, single malt, spirit of hven, sweden, whisky. Bookmark the permalink.